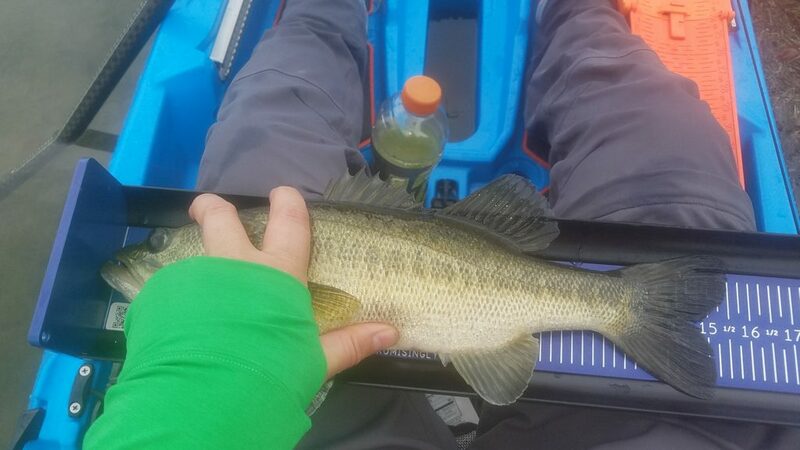 During last week’s Board Battle, looking for the potential best board for use during bass fishing CPR tournaments, we evaluated the Ketch Products Bass Board against some other boards and some criteria that really weren’t the intent of the Ketch board. Now the Ketch board gets its turn under the lights as we review it independently. 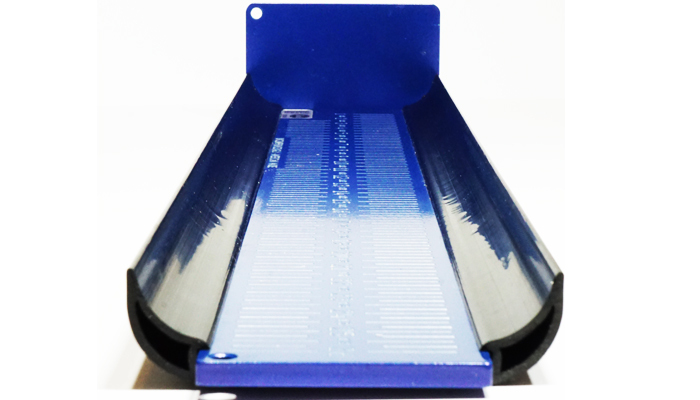 High color contrast custom coating that’s easy to read and extremely durable. 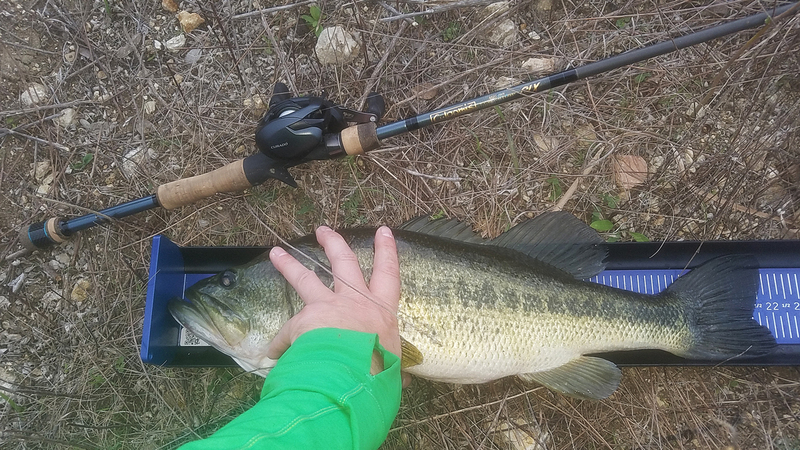 I tested the Ketch Products Bass Board that is KBF approved which measures 26 inches. The original one was only 24 inches long but as requested by KBF was lengthened to accommodate for bigger fish. The pictures you’ll see in this review are of the blue board with the Ketch Kradle attached. They can be purchased together or separately. I’ve included three different fish on the board of varying lengths. With each different size there are different considerations in how the fish lays but we’ll get into that. The Ketch Kradle really helps hold the fish on. You can also see the two tether points on the Bass Board. 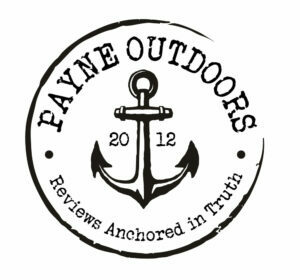 Ketch Products is a premium outdoor products manufacturer that specializes in fishing products and accessories. True to our slogan “Uncompromisingly American Made,” all ketch products are made with 100% American parts and labor… no exceptions. [Ketch]strives to bring the discerning sportsman all-American product offerings that far exceed the quality of our competition. We will simply not be outworked, out built, or out engineered. We will do this while at the same time creating good American jobs and giving back to both the pastimes we love and the veterans who gave us the freedom to enjoy them. The Ketch Products Bass Board is dang near indestructible. It’s built with that purpose in mind. They obviously heard the concerns of anglers getting their measuring devices snapped in half by a decent size fish flopping on the alternative (last place board). Even in the National Championship last weekend, there were flimsy boards snapped. The Ketch board isn’t going to snap. It’s too sturdy. The high contrast, etched lines are really easy to see. The board has enough matte finish built into it that flash photography shouldn’t impair readings much if any. From a tournament director perspective, that’s really nice. From a consumer perspective, not having to trace 1,246,723 lines with a marker is a big bonus. Knowing this board won’t float, Ketch has already drilled some tethering holes for you. No need to bust out a drill and scar it up. Just lash it and get going. Another advantage from the tournament director perspective that makes the Ketch board stand out is the QR code integration which ID’s the board to an individual angler to prevent cheating. Speaking of cheating, the amount of work and tooling to modify the Ketch Bass Board to cheat on length measurements is so great, it really eliminates THAT type of cheating. Two birds, one stone. Nice job. While it won’t matter to everyone, it should not go without stating that the Ketch Products Bass Board is made 100% in the USA. Not afraid to throw this in a backpack and bank stomp because rocks and fish tails aren’t going to hurt it. I really wish the Ketch Kradle were standard. Obviously, you can get it as an add-on and at a discount but it’s such a helpful accessory it should just be automatic. While we’re on the Ketch Kradle, I would LOVE to see it lined as well. When measuring fish, the longest part of the tail will be on the unlined Kradle which will either cause every fish to have to be eyeballed (not a good idea when $$$ is on the line) OR you’ll have to use a right angle screen test with a sheet of paper to see if the tail would have crossed the line IF the lines went all the way to the edge of the Kradle. 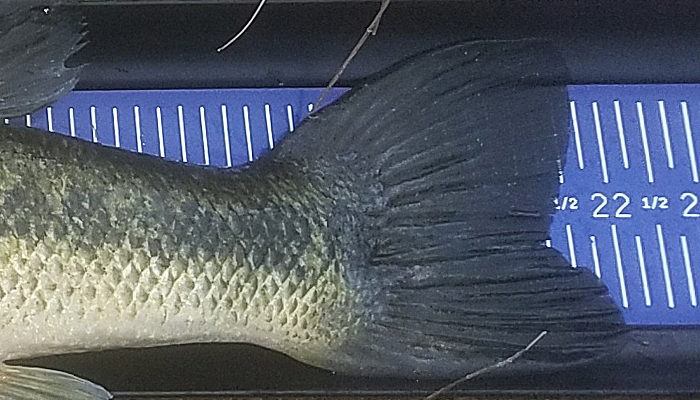 That’s a 22″ fish or a 21.75″ depending. Lines to the edge would make it easier to know for sure. This is what it is. I love the stoutness of this board. I’m not crazy about the weight. One day maybe a lighter version with great rigidity will be available but for now, I’ll handle the weight knowing the board isn’t going to fail. I’m also going to suggest an additional QR code near the back of the board in case it’s illegible from a fish face. In some of these pictures you can see it, in some you can’t very well. Or maybe at the least, etching the QR number into the very end of the board. 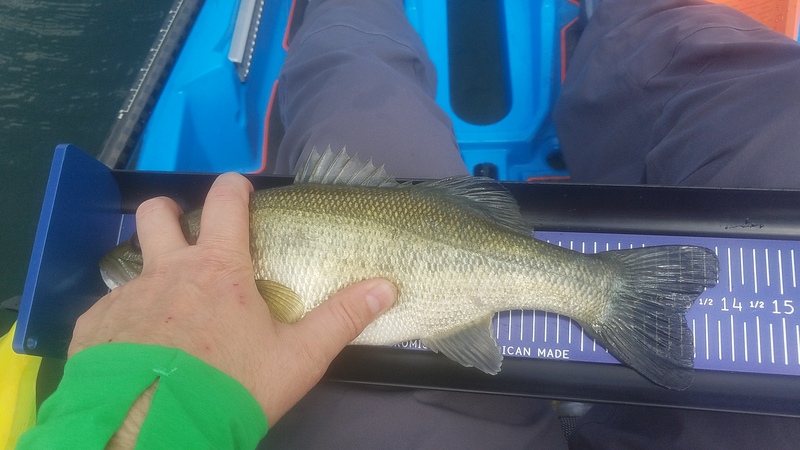 If you’re need for a tournament measuring board is for black bass, this is a great board. It’s going to be too short for striper fishermen or any larger gamefish anglers, especially saltwater (though Ketch Products does make larger boards). 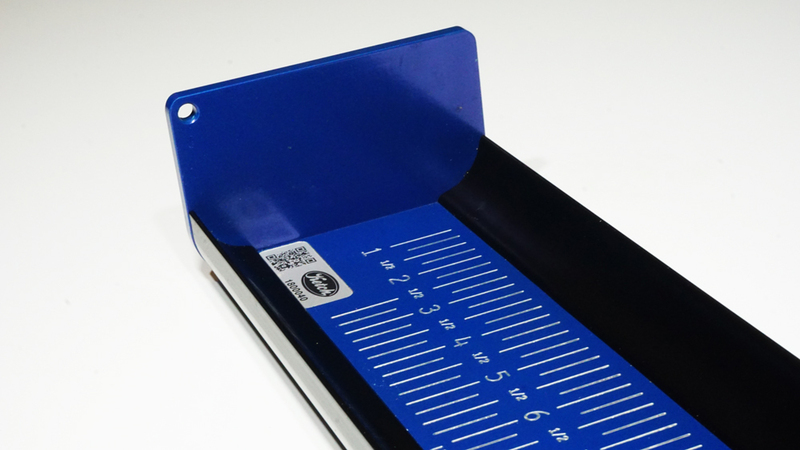 If you have bought more than two of the flimsy boards, you’ve bought too many. I know I have. This board will be perfect for online challenges or other bass tourneys. It’s also available in a lot of different colors. You can check all those out here.